The original Cat People (1942), directed by Jacques Tourneur, is both an acknowledged classic of suggestive horror and one of the most famous Hollywood B-movies of all time. 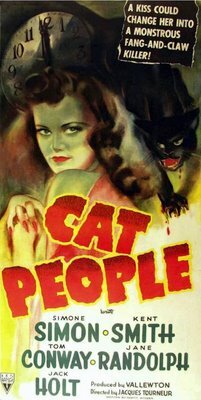 First in a series of low-budget RKO fright films produced by Val Lewton, Cat People became a surprise hit that saved the studio from near-bankruptcy following the failure of two iconic films that in their day were costly flops—Citizen Kane (1941) and The Magnificent Ambersons (1942)—directed by the mercurial boy-genius, Orson Welles. Lewton, while unpretentious by Wellesian standards, was no less hungry to make movies. Cannily, Lewton found a creative path within the system by working fast and cheap. (And finding an economical use for abandoned sets like the ornate staircase from The Magnificent Ambersons that shows up in Cat People.) He’d been a deadline-driven journalist and pulp novelist. And before being offered his own production unit at RKO studios, Lewton worked his way up at MGM as an ambitious story editor and researcher. Cat People’s disquieting atmosphere of Old World otherness combined with New World dislocation can be traced in part to the European backgrounds of Lewton, born in 1904 in what is now Ukraine, and Tourneur, born the same year in France. The film evokes a haunted American melting pot of primitive mythologies and new-fangled superstitions (i.e., psychoanalysis) ill-equipped for securing one’s safety or survival in a modern impersonal cityscape. It should come as no surprise that after working with Val Lewton, director Jacques Tourneur (along with Cat People cinematographer Nicholas Musuraca) went on to make the influential film noir, Out of the Past (1947), which helped define the genre as doom-laden and populated with psychologically crippled outsiders and social misfits. Cat People’s Irena Dubrovna (played by French actress Simone Simon) is an aspiring fashion designer of Serbian heritage living in New York City. Introspective and melancholic, she believes herself descended from a devil-worshipping were-leopard who survived an Eastern European witch-hunting pogrom in the 16th century. Irena finds herself drawn to the caged leopard in the Central Park Zoo. Her impromptu marriage to a marine engineer (Kent Smith) remains unconsummated because Irena fears that her own unleashed passion will destroy her husband just like, it’s implied, her mother may have killed Irena’s father in a sexual frenzy when Irena was conceived. Again he rode through the wood. Again he peered right and left for some sign of the beast, fearful always of seeing golden eyes glow at him from the pitch blackness of the night. Every rustle of the wind, every mouse that scampered on its way, flooded his heart with fear, and filled his eyes with the lithe, black bulk of the Bagheeta, stalking toward him on noiseless paws. With all his heart he wished that the beast would materialize, stand before him, allow him opportunities to slash and thrust and ward. Anything, even deep wounds, would be better than this dreadful uncertainty, this darkness haunted by the dark form of the were-beast. Simone Simon in Cat People (1942). Simone Simon’s complex portrayal of shapeshifter Irena Dubrovna is sympathetic in a manner not unlike that of Lon Chaney, Jr.’s bewildered lycanthropist Larry Talbot in The Wolf Man (1940), which had been a recent entry in the long line of lavish Universal studio horror hits that RKO wanted Val Lewton to replicate at a fraction of the cost. No time-consuming elaborate monster make-up for Simone Simon. Instead, characters are stalked by … something. Branches rustle. Shadows loom. Sinister growls echo from the locker room of an indoor swimming pool. Paw prints in the park appear to segue into high-heel shoe indentations. Concerns that Lewton may have gone too far in substituting shadows and sound effects for in-your-face literal scares caused studio bosses to insist that a leopard be shown during the climactic mauling death of the psychotherapist (Tom Conway) who sexually assaults Irena in his office. Nevertheless, the film’s most frightening jump-in-your-seat moment—still effective 70 years later—is the oft-copied sudden lurching into the film frame of a city bus with its air-brakes hissing. The cult status of Paul Schrader’s 1982 remake of Cat People rests largely on a couple of tangential aspects of the production. First, the David Bowie/Giorgio Moroder theme song, “Cat People (Putting Out Fire),” endures as a great Bowie track and gained further pop culture permanence with Quentin Tarantino’s wildly effective use of the song in a climactic sequence of Inglourious Basterds (2009). The 1982 Cat People relocates the story to contemporary New Orleans, where Kinski’s character Irena Gallier arrives at the film’s opening to be reunited with her brother—a shapeshifting minister played with menacing brio by Malcolm McDowell—whom she hasn’t seen since childhood. Unfortunately, before we meet Kinski and McDowell, we’re treated to a turgid 6-minute prologue of cat people “mythology.” The film never really finds an effective juxtapositional tone between its gruesome modern-day tale of sexual violence and the primal symbolism of the prologue (and a later scene set in the same blood-red dreamscape). A not dissimilar film from the same era, Ken Russell’s Altered States (1980), found a way to integrate this kind of Jung-on-acid material so that the border between waking reality and the unconscious seemed radically porous. There are compensatory pleasures to be found in Schrader’s Cat People, to be sure, beginning with its high-toned production design and sensational cast. In addition to Kinski and McDowell, there’s John Heard’s shy zoologist whose obsession with Irena brings out his inner fetishist; Annette O’Toole as Heard’s spurned love interest; Ruby Dee as McDowell’s Creole housekeeper; and Ed Begley, Jr. as the affable zoo-employee sidekick whose arm is graphically torn off in a memorable blood-spurting shock moment. Nastassja Kinski & Malcolm McDowell in Cat People (1982).